You! My intrepid daughter. Now that you are a young woman and launched into the world (from small-town Vermont . . . to Nicaragua . . . to San Francisco . . . to Ecuador . . . to wherever your passion takes you next), I want to say this—I am so proud of you! And don’t forget to carry your pepper spray! I also want to tell you about another fearless girl, this one made of bronze. 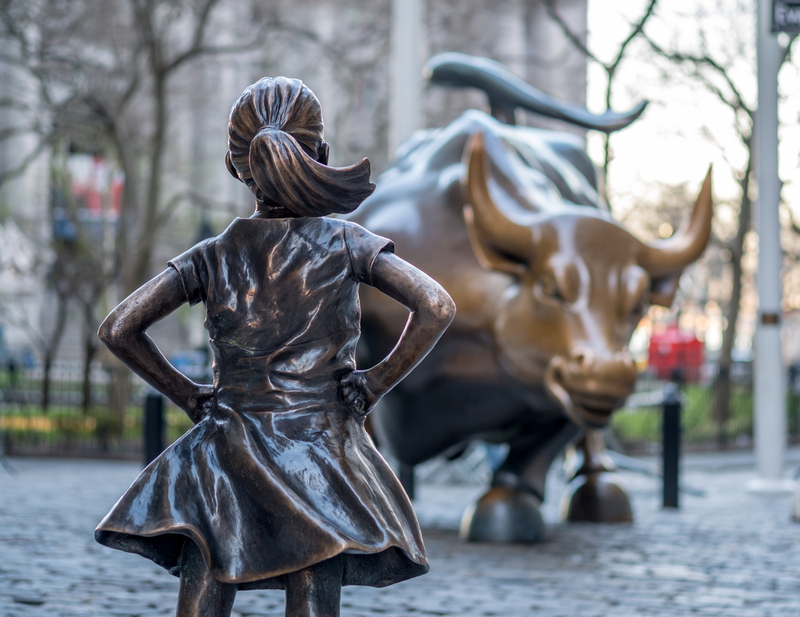 She is a 250-pound sculpture depicting a Latina child, arms akimbo, chin up, striking a proud pose as she stares down the famously formidable sculpture of Charging Bull, aka the Wall Street bull, in Manhattan’s Financial District. * With its muscular form torqued in anger, its flared nostrils, and horns that look like they could impale flying kettlebells, the Wall Street bull is a three-and-a-half-ton symbol of male aggression, financial and otherwise. The investment firm State Street Global Advisors installed Fearless Girl as part of a campaign designed to draw attention to the lack of women on corporate boards. Or, as the plaque below the child statue reads, “Know the power of women in leadership. SHE makes a difference.” The all-caps SHE is intended to play a dual role: it emphasizes the female pronoun, but it is also the NASDAQ ticker symbol for a State Street Global Advisors’ index fund that invests in companies that rank high in gender diversity at the senior level. To pile symbolism on top of symbolism, the Fearless Girl statue debuted the day before International Women’s Day in 2017, underscoring that year’s campaign theme: Be bold for change. Understandably, with her plucky pose and cute, flared dress, much of the world was enamored with this emboldened child, though I found myself echoing some of the doubts shared by the installation’s other detractors. Specifically, if the statue is to draw attention to the need for more women in leadership roles, why symbolize this with a ponytailed 10-year-old? Creative differences aside, it seemed petty not to appreciate the financial firm’s investment in this symbol of female fearlessness. Indeed, the statue remains relevant to the theme of this year’s International Women’s Day campaign: Press for progress. On this subject, we have seen a recent spate of symbolic gestures by companies and organizations that have fired some of their most prominently positioned sexual predators and harassers. One can hope these purgings represent a sincere commitment to progress and systemic change, just as one might have hoped that the financial firm that commissioned Fearless Girl actually practiced what its statue was meant to symbolize. Sadly, as it turns out, the company’s investment in gender parity was only bronze deep. Jeesh. Even Harvey Weinstein offered a half-assed apology. There is a lesson here for you, my own fearless girl, as you make your way in a patriarchal world. You will encounter blatant sexism, but you will also need to be on the lookout for pseudo-feminism—words and gestures by people and companies that pretend to be all for gender equality while practicing and perpetuating the same old same old, just like the financial firm that commissioned the Fearless Girl statue and then tried to hide behind her skirt. State Street Global Advisors’ failure to admit wrongdoing, and the paucity of women on its own board of directors and leadership team, only prove the adage that “Talk is cheap,” even if it comes with a $5 million price tag. Honey, I know you are smart and strong. Growing up, you adopted your own chin-up stance. I witnessed it often when you pushed yourself at school and on the playing field, when you confronted mean behavior and unjust practices, and as you adjusted to the reality of your parents’ divorce. Likely you don’t need your mother to warn you about the ways of an unfair world. You don’t need a statue to inspire your own fearlessness. Still, symbolic gestures (and mothers) have their place. So, my intrepid daughter, I want to tell you that I love you more than anything (and please lock your doors and trust your instincts and remember to turn off your electronic devices well before you go to bed), and I want to leave you with this closing thought: the firm that commissioned Fearless Girl may have been guilty of hypocrisy and exemplify pseudo-feminism, but its statue stands on its own. Who better than Fearless Girl to caution us about superficial gestures and hollow promises? Who better to remind us to relentlessly press for progress in the fight for gender parity on Wall Street and far, far beyond? Her form may be diminutive (and, yes, she’s too young to hold a real job), but this bronze spokesgirl is uniquely positioned to speak to the following truth: every day, rain or shine, you—and all the other fearless girls in the world advocating for a seat at the grown-ups’ table—are going to have to confront an awful lot of bull.